Welcome to the Math Salamanders Learning Fractions support page. 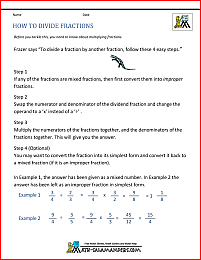 Here you will find information and support about everything to do with fractions. We have a huge range of resources, from fraction calculators and fraction conversion sheets to fraction information posters, fraction strips and flashcards. How do you add and subtract fraction? What does is mean if 2 fractions are equivalent? What are proper and improper fractions? How can I convert a mixed number into a fraction? All these answer and more you will find on this page! We have a selection of different fraction calculators which will help you to add, subtract, multiply and divide fractions. A fraction is a number which contains parts of a whole. Fractions can be smaller than or larger than one (one whole). where n and d are two numbers. The number n above the line is called the numerator. The number d below the line is called the denominator. If the numerator is smaller than the denominator (if n < d), then the fraction is called a proper fraction, and its value is less than 1. If the numerator is greater than the denominator (if n > d), then the fraction is called an improper fraction, and its value is greater than 1. If the numerator is equal to the denominator, then the fraction's value is equal to 1. A mixed number (or mixed fraction) is a number that has a whole number part to it, and a fraction part to it. 3 7, 2 10 and 17 26 are all proper fractions. 31 5, 15 10 and 37 23 are all improper fractions. 3 1 5, 1 2 3 and 12 7 10 are all mixed numbers or mixed fractions. A common or vulgar fraction is simply an ordinary fraction. The numerator and denominator must be integers, or whole numbers, and the denominator cannot equal zero. 35 45, 5 9 and 51 16 are all common or vulgar fractions. 3.2 4.5, 5 0 and 0.57 1.6 are not common or vulgar fractions. A decimal fraction is a fraction where the denominator is a power of ten. 7 10, 5 100 and 537 1000 are all decimal fractions. They are equal to 0.7, 0.05 and 0.537 respectively. 3 5, 2 12 and 263 500 are not decimal fractions. Below are some common conversions for fractions into decimals and percents. Where a digit is underlined, it means that the number has been rounded to 3 decimal places, or to the nearest 0.1%. Here is our collection of printable fraction information cards. Each card has a fraction in the middle and a range of different representations of the fractions around the outside. It is a great resource for developing fraction knowledge and useful for any fraction display. Each card also contains decimal and percent facts for each fraction. There are 3 versions of each card, one for display and two worksheets which test the children on their fraction knowledge. being to learn about fraction equivalences. These cards will help your child get to grips with fractions in a visual and fun way. Here you will find a selection of Fraction Strips designed to help your child understand their unit Fractions. Using Fraction Strips is a great way to learn your Fraction facts and help you to understand exactly how much fractions are worth. They are also a great resource for equivalent fractions, and can show children visually that a half is the same as two-fourths or three-sixths. All the free printable Math Fraction Strips in this section follow the Elementary Math Benchmarks. Equivalent fractions are fractions which have the same value as each other. A quick way to tell whether or not two fractions are equivalent is to change them both into decimals using a calculator. If the two decimals are identical, then the fractions have the same value. The printable fraction page below contains more support, examples and practice using equivalent fractions. This is also sometimes called reducing fractions to their simplest form. This involves dividing both the numerator and denominator by a common factor to reduce the fraction to the equivalent fraction with the smallest possible numerator and denominator. 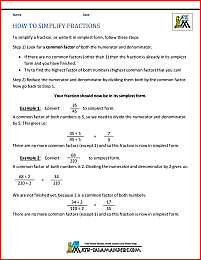 The printable fraction page below contains more support, examples and practice about simplifying fractions. This support page shows how to convert improper fractions to mixed numbers, and how to convert mixed numbers to improper fractions. 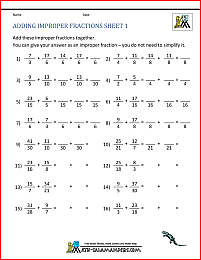 You will also find printable support sheets, and several practice math worksheets for this learning fractions skill. Adding and subtracting fractions works differently from adding and subtracting integers or decimals. If the two fractions have the same denominator, then it is quite easy to add or subtract the fractions by simply adding the numerators together. If the fractions have different denominators, then they need to be changed into equivalent fractions with the same denominator before they can be added or subtracted. The printable learning fractions pages below contains more support, examples and practice adding and subtracting fractions. To multiply two fractions together, simply multiply the two numerators together, then multiply the 2 denominators together. To divide one fraction by a second fraction, you need to invert the numerator and denominator of the second fraction so that the 'old denominator' is on the top, and the 'old numerator' is on the bottom half of the fraction. They can then be multiplied together to give an answer. 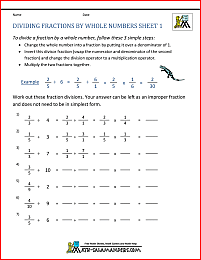 The printable fraction pages below contains more support, examples and practice multiplying and dividing fractions. To convert a fraction to a percentage follows on simply from converting a fraction to a decimal. Simply divide the numerator by the denominator to give you the decimal form. Then multiply the result by 100 to change the decimal into a percentage. The printable learning fraction page below contains more support, examples and practice converting fractions to decimals. Often when we are talking about and using fractions, we are looking at fractions of numbers or quantities. To find a fraction of a number or quantity, we need to first divide the number or quantity by the denominator. Then multiply this by the numerator to give the answer. The printable learning fractions page below contains more support, examples and practice finding fractions of numbers.